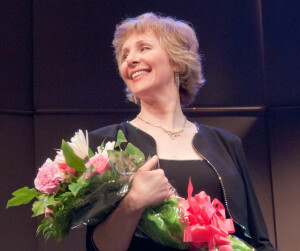 Deborah Marion joined the Golden Tones as part-time Assistant Director in 2005 and became full-time Acting Director in 2008, Director in 2009. Music has always been essential to her life, but she came to it as a vocation by a circuitous route. Her connection to singing senior citizens began with her two grandmothers, who enjoyed family sing-alongs and belonged to active performing groups well into their 80s (both lived to age 99). She started toward a career in arts management with an undergraduate degree in Communications, and after completing an MBA, took a detour into business information systems work. After hours, she sang with a prestigious Boston-area chorus, including a memorable performance at Carnegie Hall. Leaving full-time employment to raise her family, she created a small professional a cappella vocal ensemble in order to keep singing closer to home. This led to other professional musical endeavors, including preschool music time, senior center sing-alongs, and coaching a vocal class at a Boston public high school. With a life-long devotion to promoting singing for all ages, Deborah finds managing and conducting the Golden Tones to be a joyful and meaningful experience where she can exercise all her abilities to keep the Golden Tones singing. Paul Huberdeau has been an accompanist with Golden Tones chorus for several years, in addition to being assistant conductor and accompanist of choruses for both The Rivers School Conservatory and Regis College. Having studied piano at The New England Conservatory, he has been heard in solo recitals from Maine to New York City, and has served as Music Director for dozens of musicals. The concert was amazing - a great collection of songs, great singing, wonderful props, clever dancing, and nice piano music. A very professional presentation. Your attention to detail and the rehearsals resulted in a superb concert. A wonderful group with great leadership!